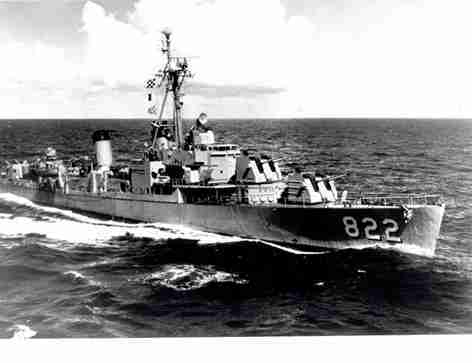 Robert H. McCard (DD-822) was laid down by Consolidated Steel Corp. Orange Tex. 20 June 1945; launched 9 November 1945; sponsored by Mrs. Robert H. McCard; and commissioned 23 October 1946 Comdr. E. A. Michael Jr. in command. Following shakedown off Guantanamo Bay Robert H. McCard joined Destroyer Squadron 10 and was homeported in Newport R.I. She operated out of Newport until 1955 on the standard employment schedule for destroyers in the Atlantic Fleet. McCard was a unit of the 6th Fleet on eight tours of duty in the Mediterranean and also participated in two midshipman cruises visiting Caribbean Canadian Belgian and Portuguese ports. Between deployments the ship had four overhauls in-the Boston Naval Shipyard each being followed by a refresher training period under the supervision of the Fleet Training Group Guantanamo Bay Cuba. In December 1955 McCard became a unit of Destroyer Squadron 4 with her homeport in Norfolk. Making a ninth and 10th tour of duty with the 6th Fleet she operated as a unit of the Middle East Force in the Persian Gulf for a month during the ninth tour. Following plane guard duties and type training exercises off the Atlantic Coast McCard participated in a midshipman cruise in June and July 1958 calling at Portuguese Danish and Belgian ports. Returning to type training exercises an Atlantic Fleet exercise in the Caribbean Fleet Sonar School duty and an overhaul McCard's homeport was then changed to Charleston. She operated out of Charleston until departing on 6 September 1960 for a NATO exercise followed by other exercises. From 29 January 1961 to 3 February she participated in recovery operations for Project Mercury then departed Charleston 8 March to join the 6th Fleet. In July she proceeded through the Suez Canal and reported to Commander Middle East Force for a 6-week patrol of the Red Sea and Persian Gulf area. She returned to Charleston via the Mediterranean 4 October. Following plane guard duties and type training exercises McCard underwent FRAM I overhaul at Boston. Returning to Charleston 3 January 1963 for refresher training during which she searched for the hijacked Venezuelan ship Anzoategui the destroyer then served for 2 weeks as schoolship for the Fleet Sonar School. She next participated in a joint Canadian-United States exercise. McCard was deployed with the 6th Fleet from 13 October 1963 to 5 March 1964 and deployed again on 5 January 1965. In February and March she operated under the Middle East Force returning to Charleston via the Mediterranean on 7 June. Following further operations off the Atlantic Coast and an overhaul period McCard underwent refresher training off Guantanamo Bay then conducted two midshipman cruises the latter taking her to Wilhelmshaven Germany. From 29 September 1966 to 31 January 1967 McCard was deployed to the 6th Fleet. Operating in the western Atlantic the Gulf of Mexico and the Caribbean until 5 November Robert H. McCard then transited the Panama Canal and joined the Pacific Fleet. At the end of 1967 she was serving on Yankee Station in the Tonkin Gulf. In January and February 1968 she was on plane guard duty for Coral Sea (CVA-43) in the Tonkin Gulf participating in an emergency search and rescue mission on the east coast of Hainan Island. In March she served as plane guard for Kitty Hawk (CVA-63) and Bon Homme Richard (CVA-31) in the Tonkin Gulf. In April she provided naval gunfire support off South Vietnam and on 10 May she departed Japan for return to the east coast of the United States. Operating in NATO exercise "Silvertower" in the North Atlantic in September and October 1968 Robert H. McCard then put into port at Southampton. Following overhaul at Charleston from December to April 1969 she operated off the Atlantic Coast and in the Caribbean until deploying to the Mediterranean in September. She returned to Charleston from her 6 months with the 6th Fleet 28 March 1970 and remained with the Atlantic Fleet for the duration of 1970 and four months of 1971. On 15 April 1971 she sailed eastward from Charleston for another six months service in the Mediterranean returning 16 October. She stayed in Charleston for the remainder of 1971 and spent the first eight months of 1972 engaged in Atlantic and Caribbean operations. Robert H. McCard entered Charleston 6 September 1972 for a six-month overhaul at the completion of which she returned to normal operations in the western Atlantic and Caribbean. She continues in this employment into 1974.